Measurements taken with a network analyzer are only accurate if the tool you're using is properly calibrated. Luckily for us, someone figured out a way of calibrating network analyzers that we now refer to as e-calibration, or e-cal, for short. E-cal is fast and easy and can make all the difference in getting good data about your DUT. E-cal units are available from test equipment manufacturers, in different styles of coax, covering different frequency bands. E-cal isn't new - here's a patent from 1993. We attribute the invention to Vahe Adamian and his company at the time, ATN, located in North Billerica, MA. 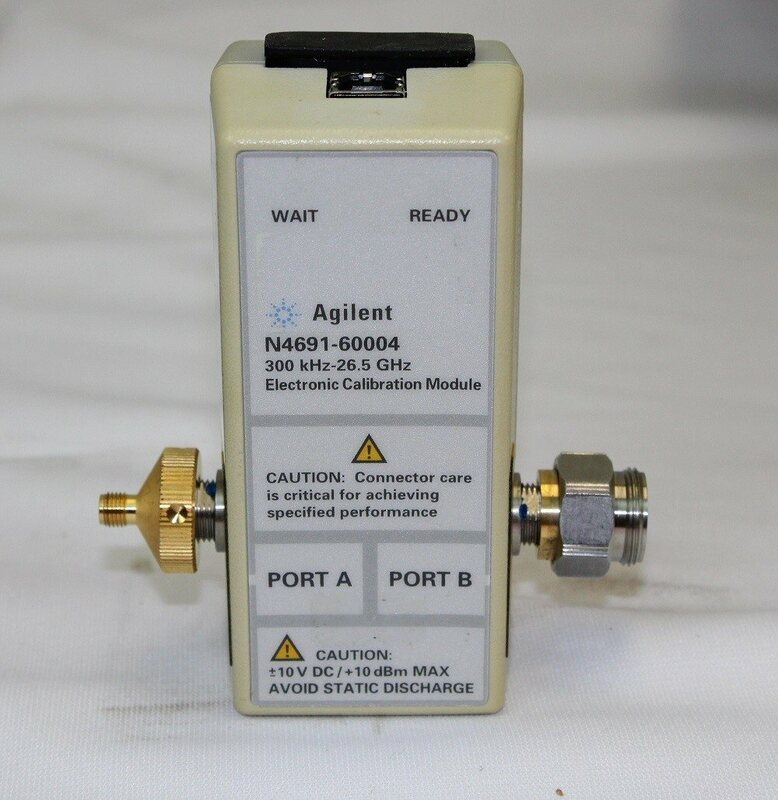 ATN was bought up by Agilent in 2000, you can guess why they did that. 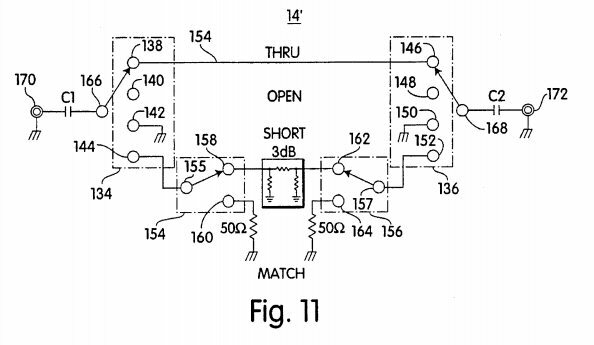 Below is Figure 11 from the patent. A switch matrix is used to configure standard to the module's two ports, rather than a technician and a torque wrench. To calibrate the old-school way (and actually, in many cases today) the user has to carefully attach different calibration standards to the cables of a network analyzer and run a calibration routine. As each standard is connected, you are prompted by the test equipment to measure them; at the conclusion the network analyzer does some math and generates a calibration file that you can store and/or use immediately. This is a time-consuming process involving the use of torque wrenches, careful cleaning and storage of calibration standards. Damage one standard and you won't be able to maintain a proper calibration. E-cal units have a means of providing calibration standards electronically, and generally use PIN diodes to control the RF path. On a modern unit there is no warm-up time, but you need to be careful about what temperature range the e-cal unit is operating in. What are the down-sides of E-cal? Cost of ownership is in the tens of thousands of dollars, far more than a set of precision coaxial standards. Sure, you can get an E-cal module on E-bay for maybe $6K, but you will certainly have to pay some money to have it checked out in a Cal lab. Never assume used test equipment has been treated well. If you drop an E-cal unit and it lands on its connector, you are in a lot of trouble, you'll have to send it out for an expensive repair. Funny, if they just added some mechanical bosses around the connectors you'd never have to worry about this. But bosses would make wrench access to the connector a little bit harder, so don't hold your breath for this improvement. You should keep a mechanical standard or two handy, just so you can check the goodness of the calibration (there is no setting on the e-cal module that creates a perfect through-line). The temperature range must be tightly controlled, maybe +/- 3 degrees Celsius, or 20-26 degrees room ambient. The calibration you are making is an example of an indirect measurement. You are counting on the manufacturer's calibration of the E-cal module to be accurate, and stable, because there are no perfect switches in the universe. If you were building furniture and trying to cut precise boards so they line up to an exact dimension, this is the equivalent of cutting one board, then using it for a pattern for the the other boards. If you don't understand why that is an issue, you might not want to choose a different hobby such as knitting. If you work at NIST, you might not even allowed to use an E-cal module, and maybe you've never seen one! Generally, the benefits of convenience far outweigh the problems with E-cal, so long as you understand the limitations. Here's a short video from Keysight showing a typical E-cal procedure. Presenter Rosana Cheruvelil is really smooth and makes it look easy. It is!